On March 12, the EUCAP Nestor field office in Hargeysa, Somaliland, was officially opened by the Head of Mission Etienne de Poncins, who arrived from the mission’s HQ in Djibouti earlier that day. The Head of Mission met with the Vice-President of Somaliland, Abdirahman Abdillahi Ismail Zeylai, who welcomed EUCAP Nestor in Somaliland and confirmed that the authorities will facilitate the work of the mission wherever they can, EUCAP Nestor said in a statement. “The excellent cooperation between Somaliland and EUCAP Nestor will be further enhanced thanks to a permanent presence of the mission in Hargeysa” said the Head of Mission during the courtesy call. “We will be able to run additional activities and trainings and coordinate more closely with our counterparts in the field of maritime security”. While EUCAP Nestor activities and trainings with Somaliland regarding maritime security have been ongoing since some time, in the past they were carried out by mission staff based in Nairobi on board EU Naval Force vessels. From now on, EUCAP Nestor will have police, legal and maritime experts deployed on a rotating basis to Somaliland in order to work together with their counterparts to design and run mentoring, advisory and training programmes in the area of maritime security and governance. During his visit, the Head of Mission also met with other high level representatives from the Somaliland Government amongst them the Vice-Minister of Interior, Osman Garaad Soofe, and the Executive Director of the Counter-Piracy Coordination Office, Mohamed Osman Ahmed, to discuss further possibilities of cooperation. Deqa enrolled at WA during her junior year, her studies here made possible by a $50,000 annual gift from Lori and Harry Emmons ’60, specifically to bring students to the academy from Africa. More recently, the generosity and intention of the Emmonses was formalized as an Endowed Scholarship through a $1 million gift to the academy’s ongoing capital campaign. Deqa’s success underscores the investment of WA alumni and highlights how the concept of global impact is interwoven into the academy’s past, present, and future. Somalia is struggling to recover from two decades of civil war, overlapped with recurring drought. Trauma from the war affected Deqa’s father so much that he could not care for his family, leaving her mother with sole responsibility for three children. Surrounded by ongoing conflict and struggling to survive, Deqa’s mother still made sure that her children attended the best public schools in the city of Hargeysa. While Deqa despaired, her mother encouraged her to take one more test. This time, Deqa’s efforts were rewarded as she earned the highest score of any girl in the country. She was accepted to the Abaarso School of Science and Technology, “Abaarso Tech,” a boarding school with a unique mission. In 2008, Mr. Starr traveled to Somalia with an uncle who had grown up there. He was impressed both by the depth of devastation that had occurred and by people’s enduring efforts to rebuild. The country’s education system symbolizes its struggles: The United Nations estimates that four out of ten children in Somalia attend school. Within a year, Mr. Starr had closed his investment firm in Cambridge, MA, and opened a boarding school in the desert 17 miles west of Hargeysa. “I thought that I may never again in my life see an opportunity to contribute in such a significant way,” he says. What would happen if African peoples where given the chance to vote in referenda to decide which country they wanted to be part of or if they wanted their own? The referendum in Crimea is a dangerous precedent reminiscent of the Austrian Anschluss and the other uprisings in eastern Europe to join Germany in the 1930s. I used to think that Europe’s states had grown naturally, organically – in contrast to Africa’s imposed borders. That I thought was a major reason for Africa’s weak states and small local wars. Then I read up on the post World War One settlement and discovered that Europe’s borders had been reset by three men: Woodrow Wilson, the American president, and two Europeans; David Lloyd George, the British Prime Minister, and Georges Clemenceau, the Prime Minister of France. As a result of the lines they drew on the map, the tribes of Europe were reorganized, some freed from foreign rule, some forced into countries they felt no loyalty to and some displaced and forced to leave their homes. It was a mess and planted some of the seeds of World War II. Africa’s arbitrary borders, mostly drawn by people who had never set foot in the continent, have always been an obvious target for renegotiation. But Africa’s first rulers, who foresaw chaos and disintegration if the nation states were reconfigured, ruled it out. “Respect for the sovereignty and territorial integrity of each State” was one of the founding principles of the Organization of African Unity (OAU), the forerunner of the African Union. Despite all the wars, internal and external, this principle has been pretty much adhered to by both presidents and people. Loyalty to an African state is not always related to the ability of that state to make the lives of its people better. Patriotism, an emotional thing, does not take these benefits into account, even in countries where the majority of citizens are marginalized or oppressed by the government. Even in the catastrophic recent meltdown of South Sudan after just two years of independence, no one is advocating return to rule from Khartoum. In the dying days of Mobutu’s Zaire (now the DRC) I was astonished to find that people felt it to be a great country. I asked why Katanga, the rich south east province, didn’t secede – as it had in 1960. My suggestion was greeted with shocked surprise. Abdikarim Salah Mohamud left Somaliland in 1988 for Melbourne and returned 23 years later to start Hargeisa Taxi. (CNN) — It’s a typically buttoned-up, breezy night in Hargeisa when a child is born in one of Abdikarim Salah Mohamud’s minivan cabs. The cab’s driver stands at the side of a dusty backstreet. In the back of the minivan lies a young woman and her newborn son, his impromptu arrival relayed anxiously via phone to the Hargeisa Taxi office. Mohamud’s assistant, a soft-spoken beanpole called Ahmed, coaches his charge calmly throughout as the baby makes his unscripted world debut. “No one even woke me!” Mohamud says. Hargeisa is the capital city of Somaliland, a breakaway state that clamors for independence from its terror-torn neighbor — Somalia. Shattered by decades of civil war, dictatorship and terror, the city is racing toward a better future: bright new office blocks poke out from the desert and markets, once empty, throng daily. But there’s still only one well-paved street in Hargeisa. Every other one is a chalky, rock-strewn dirt track, bullying cars into early retirement. It’s a tough place to found a taxi service; tougher still if, like Mohamud, you’re intent on giving Somaliland a cab service fit for a Western city. 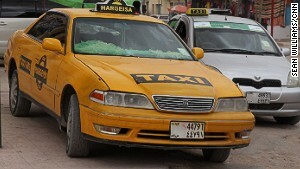 Hargeisa Taxi wants to bring a little “yellow cab” color to Somaliland. “Every second week we have to change the cars’ tires because of the roads,” Mohamud tells me at his villa on the edge of town, air thick with the smell of sweet Somali tea. He’s a small, rawboned man, sharply dressed with a shaven head and a deep, booming voice. Hargeisa’s roads may have put many a dent in Mohamud’s cars. But they haven’t broken a dream, made in Melbourne where he drove a cab for more than two decades, to make taxis accessible to all Hargeisans rather than to simply a small elite. Hargeisa Taxi recently celebrated a year in business. READ: Is this the world’s most awesome taxi? Before then traveling across town was different. 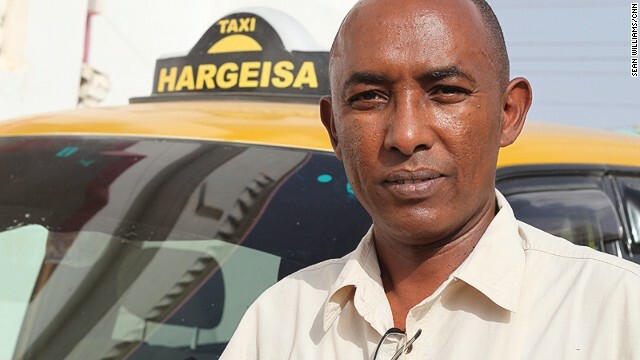 “When we started out, Hargeisa had a few unmarked cabs,” he says. “If you didn’t speak Somali you wouldn’t know which one was a taxi and which was a private car. We wanted to change that. “The price of a cab from Hargeisa city center to where we are now cost about 100,000 Somaliland shillings,” says Mohamud. “That’s the equivalent of $15, a lot even for Melbourne. But that was the deal: you paid $15 or you walked. “There were only five taxi stands in the city, so you had to get to one first,” he adds. “Even without the fare being the issue, how are you going to get a cab? Hargeisa Taxi knocked 80 percent off the fare, a feat advertised across the back of every one of its car: ANYWHERE ANYTIME $3. Cabs are ordered by cell phone, one of few modern technologies ubiquitous in Somaliland. Even nomadic farmers make deals on their handsets these days — a sign of progress in a state that’s suffered more than most the past century. From British rule to united Somalia in 1960, Somaliland has clambered toward quasi-independence past the brutal dictatorship of Mohamed Siad Barre, which ended more than two decades ago, and numerous failed insurgencies by Al Qaeda affiliate group Al Shabaab. 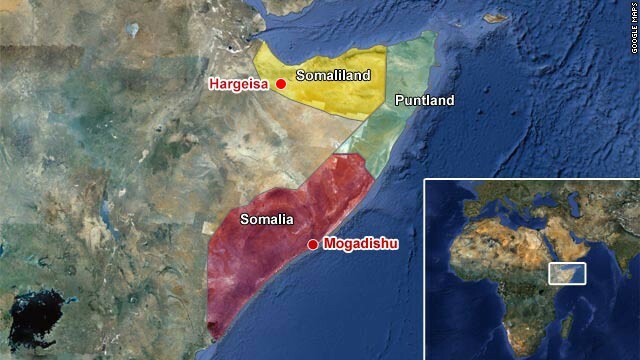 It remains, officially, a region of Somalia. But while Mogadishu’s fragile government lays besieged by deadly terror attacks, Somaliland hasn’t suffered an attack in four years. Mohamud left Hargeisa in 1988 at age 17 to study communications in Melbourne, becoming one of the million or so members of the Somali diaspora. To make money he drove cabs — a job he’d continue part time for the next 23 years. When he returned home in May 2011 to work on a project for a local TV station, the draw of a safer Somaliland was strong. Six months later Mohamud resigned from his media job in Melbourne and seven months after that, using money he’d saved in Australia, Hargeisa Taxi was up and running. There’s only one well-paved street in Hargeisa. MORE: Which city has the world’s best taxis? Starting a company in a country that doesn’t exist, unsurprisingly, is no smooth ride. Unemployment is a big worry across Somaliland. Some fear it could drag Hargeisa’s young men toward Al Shabaab’s deadly campaigns, which currently bubble just beyond the border with Somaliland’s partially autonomous eastern neighbor, Puntland. Returning diaspora members such as Mohamud, however, are driving Somaliland away from its turbulent past, pushing its economy into the black and providing low-level employment. This feels especially vital in a religiously conservative region where families often reach double figures. “The youngest of our drivers is 24 and he has two kids,” Mohamud says as his own little girl, the youngest of five children, clambers all over him. Security in Hargeisa has also changed. Not long ago violence and crime were rife and all foreigners were mandated to travel with an SPU, or Special Police Unit — often little more than a vigilante with a rusty AK-47. Now it’s rare to see anyone other than military personnel wielding a firearm. Mohamud believes his cabs are helping the shift toward peace. 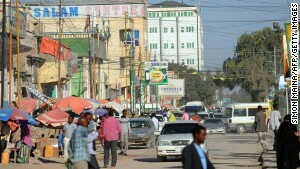 Hargeisa is still well off the beaten track. A new airport and the discovery of mineral resources may change that. The city itself is a dusty oasis crammed full of roadside cafes and markets selling handmade goods. A few miles outside Hargeisa is Laas Geel, a series of ancient hand-painted caves. Thankfully, Hargeisa Taxi has an answer. He’s referring to a device that enables the disabling of any of the cars at the push of a button. Hargeisa Taxi takes measures to ensure a safe ride. Since Hargeisa Taxi began operating, three other taxi companies have popped up: Dalhis Taxi, Maroodi Jeh and Raaxo. The latter, with its fleet of tiny Kias and Toyotas, has given Mohamud a run for his money. But Hargeisa Taxi’s 35 sedans and minivans offer greater luxury and accessibility for the elderly and disabled. And there’s no mistaking their bright, jonquil color. “It’s similar to New York or Melbourne,” says Mohamud. “The idea was that people who come here — whether they speak Somali, English, Arabic or even Chinese — would have seen at least one movie with yellow taxis in it. We may not have the infrastructure of those cities. But we can have the taxis. Mohamud’s family join him in the room, asking questions and drinking tea. A car revs up outside. I ask if he misses anything about Australia. Sean Williams is a British writer and journalist covering topics from culture and politics to real estate and cricket.